We have been crazy busy lately. I started working at my new job last week, and it has been exhausting. I work for a company located in Niagara Falls called Community Missions. There are a lot of divisions of the company, but our jobs all overlap a little. I am a Case Manager, and it has been a whirlwind learning the ropes. We work with clients who have a mental illness but are trying to gain independence to live in the community. Already I've had some interactions that have blown my mind. Aside from work, we have been enjoying the weather. 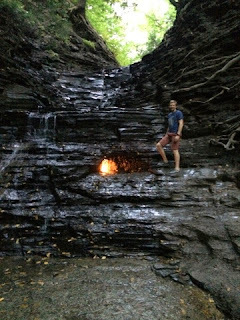 We went on a hike called the "Eternal Flame". It's a permanent methane gas leak that allows there to be a constant flame. It's in the middle of a small, slippery waterfall. The hike was really pretty and fun.